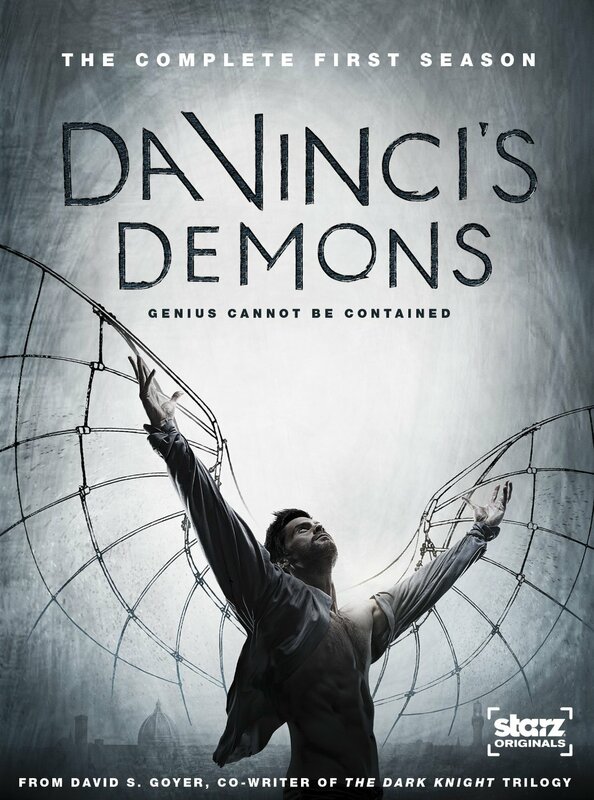 From its opening moments of buttocks and blood (both belonging to an uncredited Hugh Bonneville if that floats your boat), it’s clear that Da Vinci’s Demons is going to have its fun whilst playing fast and loose with the early life of its subject, Florentine polymath Leonardo Da Vinci. Conceived by David S Goyer and a co-production between Starz and BBC Worldwide, it’s a good-natured romp of a drama series much in the mould of Merlin, Atlantis or the lamented Sinbad but perhaps tied a little closer to reality as it dips in and out of the tangled history of the Italian city states. And it is its historical connections that serves as a main driver for the technological innovations for which Leonardo is famed and which form the ‘issue of the week’ around which most of the episodes hang. So as Da Vinci climbs into bed with the ruling Medici family, he’s sucked into their political machinations whilst battling rival families in Florence and the ever-present threat of the Catholic Church in Rome. Alongside this sits a more fantastical series-long arc about the mystical Book of Leaves and the Sons of Mithras who believe Da Vinci has only just begun to tap into his true power. 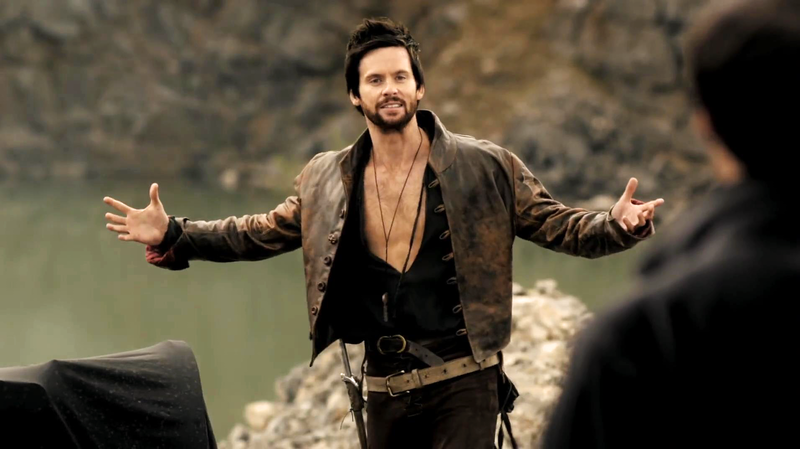 Tom Riley is perfect casting as the inventor. Extremely easy on the eye (and bless the costume designer who decided on the acres of cleavage ;-)) and highly charismatic, he’s an engaging protagonist and for someone this clever, not too annoying with it. The way in which his inventions come to mind, with rotoscoped animation superimposed on the screen, is appealingly done and so whether it is rotating cannons, hand grenades or scuba diving suits that are coming to mind, Riley ensures that there’s a swaggering sense of fun about the whole affair. Around him, there’s a wealth of supporting characters and possibly a few too many to really connect with over the 8 episodes here. Friends – Gregg Chillin and Eros Vlahos as the roguish Zoroaster and Nico; colleagues – Allan Corduner’s Verrochio; lovers – Laura Haddock’s luminous Lucrezia Donati; enemies – James Faulkner’s Pope Sixtus and his sinister nephew Riario, a superb Blake Ritson. And top of the bunch for me, Elliot Cowan as Lorenzo de’ Medici and Lara Pulver as his wife Clarice Orsini, excellent actors both and fascinatingly complex as the ruling family, aided by Tom Bateman’s enthusiasm as younger brother Giuliano. It also manages to fit in an inordinate number of notable guest stars too – I loved Lydia Leonard’s prim Queen Isabella and Philip Arditti’s comparatively liberal King Ferdinand of Spain on their state visit, Simon Paisley Day’s hypocritical judge, Paul Rhys’ Vlad the Impaler in one of this series’ best episodes, and the Pazzi conspirators who include a wonderfully sibilant Elliot Levey, Michael Culkin and David Sturzaker, who take the show to its first cliff-hanger ending. It’s a crazily overloaded journey with new secrets emerging every three minutes and betrayals every five minutes but because the overall feel is one of fun, it’s easy to be forgiving here. For it is really rather entertaining. The randomest pair of sunglasses you ever did see, some spookily prescient business with sticking unmentionables into pigs, a naked scene in a sauna (hello gentlemen ;-)) and some excellent visual effects work that transforms Wales into rolling Florentine landscapes and city vistas most impressively. Better to have too much ambition and hope for renewal than to splutter away quietly and it’s good to see that future series were commissioned to allow the writers and actors more room to develop complexity as well as excitement.